The Isle of Skye is somewhere I’d had my eye on to visit for some time. I had spent so much time looking at photos of it and often wondered when I would get the chance to visit this romanticised, secluded isle. Then my mom came for a visit from Canada and wanted to go away somewhere for a long weekend – the perfect opportunity to go had arrived! My mom, my brother, James and I all jumped into a rental car and off we went over the Easter weekend. Leaving from Newcastle, we had a 6 and a half hour drive ahead of us to get to our Airbnb, which was just on the other side of the Skye Bridge. A 6 and a half hour drive wasn’t ideal to be stuck in a car, but manageable – especially when you’re driving through the amazing Scottish countryside. We had completely forgotten to take the unavoidable long weekend traffic into account. And we couldn’t have predicted the big lorry that drove off the road, causing a traffic jam that added at least two hours to our trip (we don’t think any big injuries occurred from what we saw, thank goodness). We were racing the sun by the end of the day and managed to get there just as it was going down! 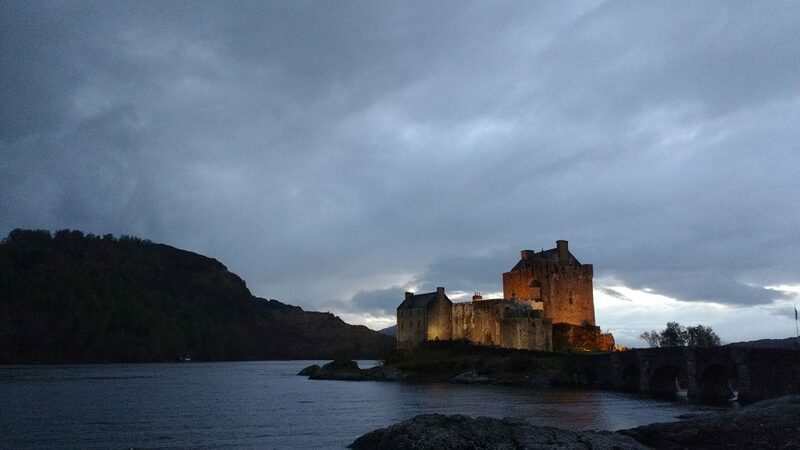 Although, to James’s excitement, this created a dramatic background to take a picture of the famous Eilean Donan castle, used as a set in the movie ‘Highlander’, as we passed it. We stayed in an Airbnb called Hilton House in Broadford. Upon first appearance, we were thinking, “Oh no. This looks old and outdated. What were we thinking when we booked it? !” But when we parked and walked in it was another story altogether. We entered a spacious kitchen that was stocked with all the essentials. Next door was a large dining room/living space with three big windows that, once the morning arrived, gave us a fantastic view of the sea and mountains! Every morning we sat on the couch, gazed out at the views, and sipped on a cup of coffee. We couldn’t have asked for a better start to each day. The upstairs consisted of two bedrooms; one was a double that James and I quickly claimed (being the couple, of course! ), and my mom and brother took the two singles. The bed and pillows were so comfortable that I ever so slightly considered spending the weekend just lying there, rather than seeing Skye itself (only for a second, though!)! We planned out our itinerary for the next two days and figured out what would, unfortunately, have to be cut due to lack of time and what was at the top of our list. Two things were very clearly at the top and couldn’t be missed: Old Man of Storr and the Fairy Pools. A close runner-up was Neist Point. So we divided our two days into doing the east side of the island on one day and the west on the other. At the beginning of our first day (which wasn’t exactly early… we needed a lie-in! 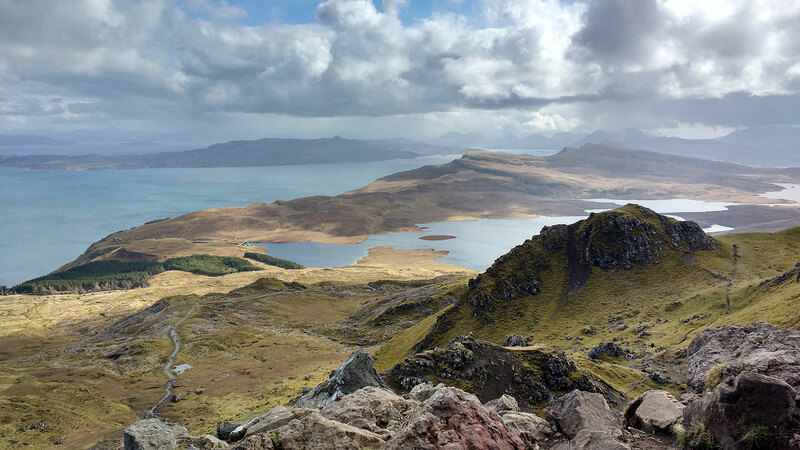 ), we drove straight up to Old Man of Storr. Once we got parked (it was busy!) we jumped out of the car and started the ascent up the mountain. 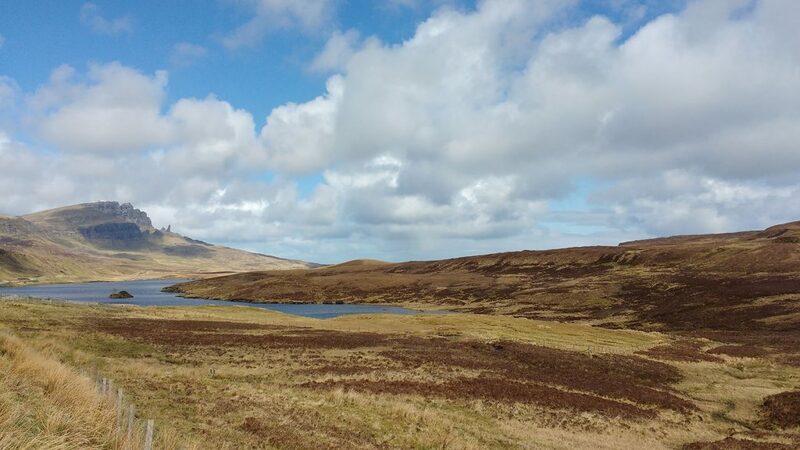 The drive to Old Man of Storr – you can see it sticking up in the distance! It started as a gradual, uphill climb on a marked path that was full of other tourists going both up and down the mountain. As we got higher, the number of people thinned, it got steeper, and the path disappeared, leaving us to choose our own route up to the top. We scrambled higher and higher for about an hour until we finally stretched our hands out and touched the finish line: the Old Man himself; a massive boulder that stands about 50 metres high – which is the height of 11 double-decker buses! 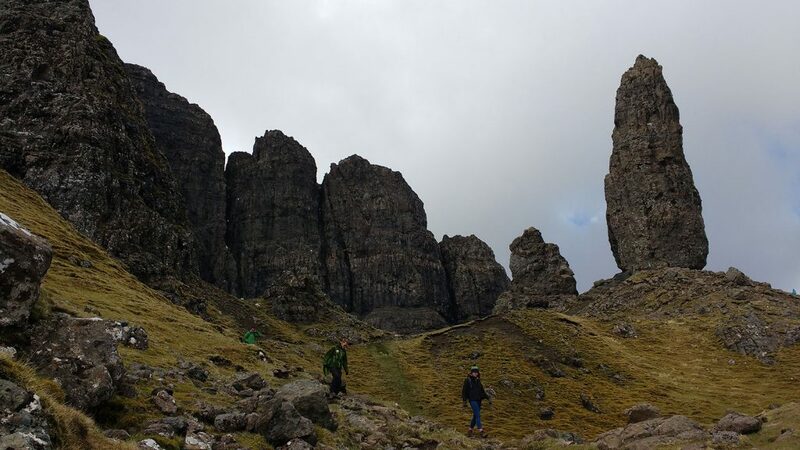 Old Man of Storr – It really is quite massive! When we turned around, the scenery stretched for miles (and we mean miles). We could see our car on the road, big blue bodies of water to the north and west, and even further away we could see lines of mountains. We sat under the Old Man along with a bunch of other hikers and took in as much of the dramatic, unspoiled scenery as we could before deciding it was time to go down. 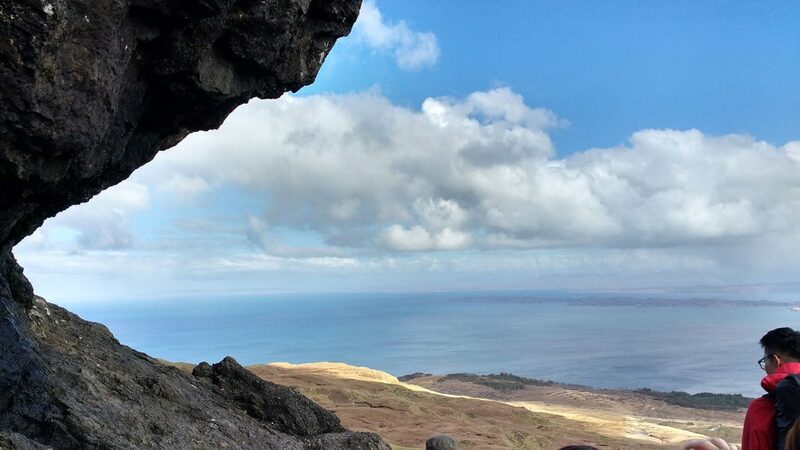 The view looking west while sitting under the Old Man of Storr. 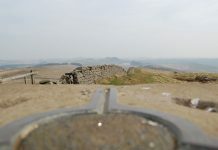 The header image of this article is the view North. We took a quicker, slightly different, slightly more treacherous route down, which resulted in plenty of running, sliding, side-stepping, and falling (to each other’s amusement) to get back to the marked path and easier terrain. We all had massive smiles on our faces from the adventure and climbed back into the car to head back to Portree, the largest town on the Isle. Portree is a cute and colorful town full of unique and eye-catching shops. We gobbled down some sandwiches from the grocery store then popped in and out of a few of the shops, checking out some local crafts and spending some time in a bookstore in particular. We checked out the seafront and spent some time watching the boats bob up and down. We also came up with life stories for a group of seagulls that were acting a little strange in the harbour (you can’t say we don’t know how to entertain ourselves!). We made our way around to the other side of the bay where we found a hidden path behind a small fence. Curiosity got the better of us, so down the path we went. We had only walked a short distance when we came across a fantastic panoramic view looking back on the waterfront of Portree and the colorful buildings lining it. What a nice surprise! We had plans to continue driving up to the northern point of the isle then loop back down to Broadford to end the day, but we were running out of time and figured we should turn back now in order to make it to a local restaurant before closing time. We had already picked The Claymore restaurant to try and were looking forward to trying some freshly caught seafood. James and I both feasted on a delicious, albeit small, piece of cod that was perched on top of a massive pile of garlic mashed potatoes, which was preceded by a plate of mussels cooked in a white wine and garlic sauce. Delicious. My brother went all out and ordered the seafood platter for one, and my mom ordered fish and chips. It would be wrong to not wash it all down with a local ale, of course, so we hastily ordered a round of Isle of Skye ale. It would also be wrong, obviously, to not sample the delicious desserts that had caught our eye in the menu. The Bailey’s cheesecake, the sticky toffee pudding, and the ice cream sundae didn’t last very long when they arrived. 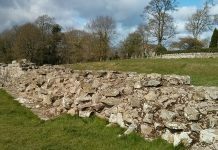 With full bellies and tired legs, we headed back to our accommodation and crashed. Day two brought with it the excitement of exploring the west coast of the island. The first port of call for the day was the Fairy Pools. We spent between 1-1 ½ hours walking along a path that ran alongside many crystal clear blue/green waterfalls and pools, in the presence of pretty awe-inspiring surroundings. It’s a stunning place to visit. Incredible. This picture really doesn’t do the place justice. Even though the water was freezing cold, we still came across some brave/stupid (choose your own adjective) people that stripped down and jumped right in! Each to their own, we guess! 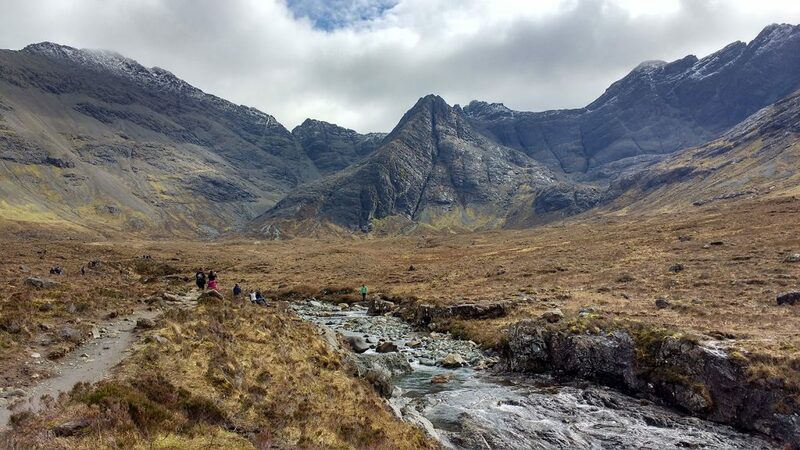 We’d really enjoyed our visit to the Fairy Pools, but it was time to move on. Unfortunately, it wasn’t until we got back home that we realized that we hadn’t seen one particular big pool that is the focus of many photos from that area. We’re disappointed, but oh well, that means another visit is needed! (Which was already on the cards anyway, by the way). We continued our drive up after the Fairy Pools to Neist Point, and boy was that ever an experience. The last part of the road is so small that it’s only wide enough for one car at a time, although it’s a two-way road. 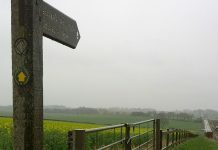 There are a lot of passing points on the road, which should make this easy enough to navigate but some people, for whatever reason, struggled to grasp the concept of using them! Either way, it made for some entertainment, some frustrations, and my mom got to work on her traffic-directing skills. It was obvious when we reached our destination, as there were loads of cars parked at every angle, so I joined in and pulled into a spot. The walk to Neist Point starts abruptly: an extremely steep stairway leads you down to where you need to be. A path leads you around Neist Point itself, ending at an old lighthouse on the edge of the cliffs. We began with the steep and pathless climb up to the Point itself. It didn’t take very long but was the steepest climb that we did over the weekend. We were lucky as we reached the top, as there was no one else up there. We were able to sit down and admire unspoiled and unpopulated views of the miles and miles of ocean that stretched out before us. The view from Neist Point. Thar be the Outer Hebrides! 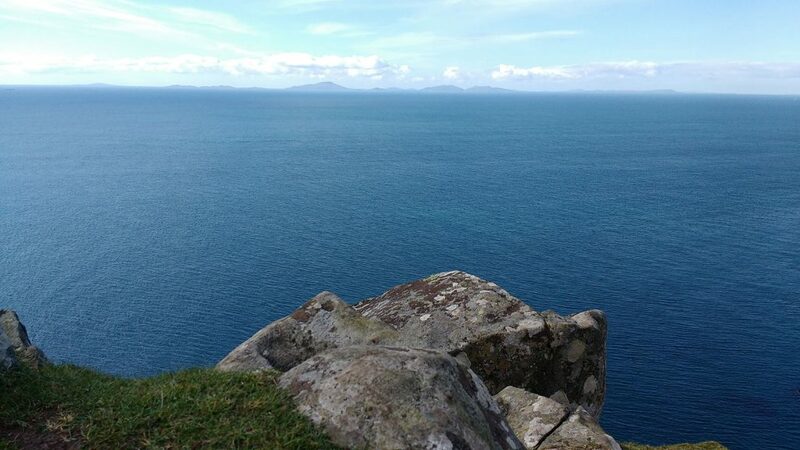 It was such a clear day that we could easily see the Outer Hebrides across the sea. We took a few pictures before I actually realised how high up we were, how close to the edge we were, and how windy it was. I started to get butterflies in my stomach and stayed low to the ground after that! We headed back down towards the lighthouse, which resulted in yet more sliding, running, jumping, and falling (yes, we were wearing hiking boots on both accounts, but maybe we shouldn’t be so hasty?!). The lighthouse itself is now a Category B listed building, and was first used in 1909. The place is rundown and abandoned, as the lighthouse is now controlled by people all the way back in Edinburgh. The dilapidation is a bit of a shame, but it does give the area plenty of charm and mystery! 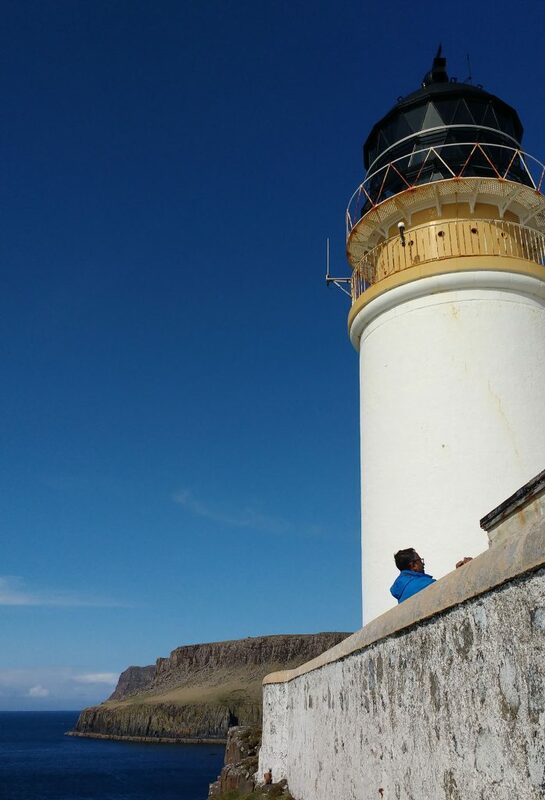 The lighthouse at Neist Point. We spent a long while at Neist Point but it was eventually time to head back, which meant tackling that extremely steep staircase again – not fun on a warm day when you’re low on energy. We also weren’t looking forward to driving back down the tiny roads either (we were lucky enough to meet some not-so-clever drivers going both ways!). However, on our drive back, a sign caught our eye that said, “New Born Lambs This Way! All Welcome!” We all immediately agreed that investigating further would be a good idea, so I turned the car off the road and pulled up to a local private farm. And boy, what an experience we had. There were about 60 sheep and 40 lambs in the barn, and it was feeding time. We were in fits of giggles as we watched both lambs and sheep pushing each other around, trying to get the first nibble of food. Some got quite vicious, some got squished up against the wall, and some were tipping the feeding troughs right over! But none of them backed down, and they all bleated constantly until they were satisfied with their meal. We couldn’t stop laughing at the racket they were making! We were then lucky enough to see lambs that were only 12 hours old, and then be able to hold a baby lamb that was only two weeks old! It settled down right into our arms, and it even fell asleep as I was holding it. I was very tempted to take it home with me but decided that my landlord (who doesn’t allow pets) wouldn’t be very happy with this, so I put him back down in his pen and we went into the craft shop in the barn instead. 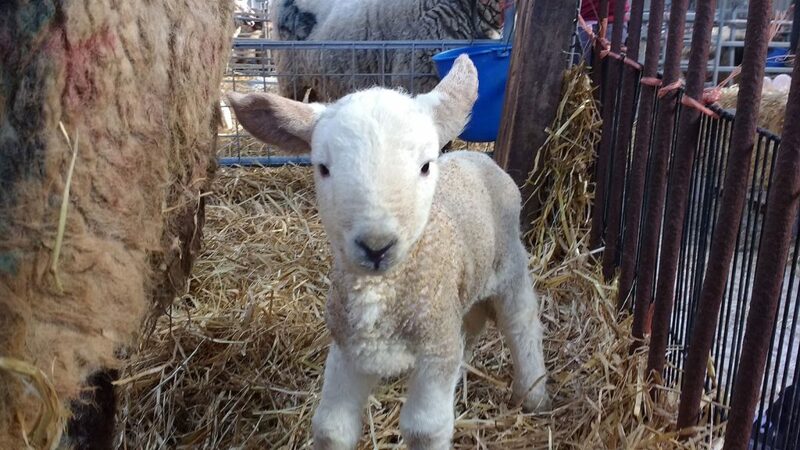 The lambs were extremely cute! The shelves were lined with handmade crafts, many of which were made directly from the sheep’s wool. There were paintings, needle crafts, homemade jams, the list goes on and on. Apparently, Kelpie Cottage has over 30 crafts for sale, all made by the hands of the owner. We spent about an hour in total at her barn and listened to her fascinating story while admiring her handiwork. As we were about to purchase our souvenirs, however, a woman rushed into the shop and said that there was an emergency. A ewe from a neighbouring farm was in labour, but experiencing huge complications. The poor sheep was brought over and, after a quick examination, the farmer started to try to pull the lamb out herself, reaching in with her arm up to her elbows. The four of us stood from a distance and watched, our jaws literally dropped at what we were seeing. Unfortunately, the story ends in a sad way. The owner of the pregnant ewe had made a mistake by pairing the ewe with another breed of sheep that was much larger than her. That meant the lamb was too big for her womb and too big to give birth too. It turned out that it was impossible to get the lamb out safely due to its size, so they took both of them away and sadly had to put the mother down. To make matters worse, the lamb didn’t make it either. As sad as this was to experience, it was also fascinating and a memory none of us will ever forget. We left Kelpie Cottage with some souvenirs too, and we would highly recommend anybody stopping in while out visiting Neist Point. If you’re around in the spring, during lambing season, it’s generally a delightful and enjoyable place to enjoy the sheep and newborn lambs. It was an unforgettable experience and the owner herself was great to have a chat with as well (and had originally lived in the North East of England – where James is from!). The next day we headed off on the long drive back to Newcastle, all exhausted after a non-stop couple of days exploring a remote and truly breathtaking part of the world. There are so many things that we couldn’t fit into only two days, so we would recommend a longer trip here if you can manage it. We could easily plan another 2-3 days of things to do and see, so will keep them in mind for the future! Have you been to the Isle of Skye? Did we miss any must-visit locations? Let us know!